A photograph of every stage should be taken. On the record of manufacture sheet, simple describe what is seen in the photograph, so that you can recognise it when you produce the Scaled Model Summary Sheet. This sheet(s) should be included in the design portfolio. 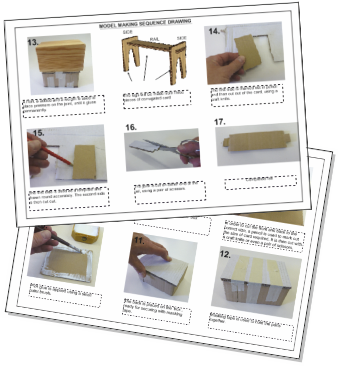 See sample Model making - Record of Manufacture. The Scaled Model Summary Sheet. 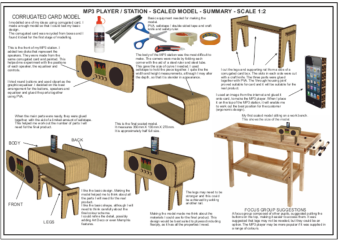 Briefly describe the important stages of making the model, with a photograph representing each important stage. This development sheet should include the information you collected on the record of manufacture sheet(s), written and presented carefully. You must emphasise how you have developed / changed the original design, as you have manufactured the model. See sample Scaled Model Summary Sheet. Produce a sequence drawing, with text and photographs. Explain every stage of making the model. The sequence drawing may be two / three pages in length, or even longer. See sample Sequence Drawing Sheets.